The MC560 is the ideal office support. The MC560 has all the OKI Printing. The MC560 features at a glance. The MC560, designed to support and improve. work to make the MC560 very cost effective the MC560 one of the most versatile. Automatic duplex printing (2-sided). Up to A3 size printing. USB, Ethernet & Parallel connections. Print up to 26ppm (Colour) & 32ppm (Black). Print, Scan, Copy & Fax. We will always go out of our way to source the product you are looking for. USB 2.0 & Ethernet connections. Print up to 16/12ppm (Mono/Colour). Print, Copy & Scan Functions. We will always go out of our way to source the product you are looking for. Add to Favourites. Automatic duplex printing (2-sided). Print up to 20ppm (Colour). USB & Ethernet connections. Print up to 32ppm (Mono). Print, Scan, Copy & fax functions. We will always go out of our way to source the product you are looking for. OKI MC560 MFP Printer. A4 Colour Multifunction Printer; Copier, Scanner, Fax. Plus a powerful engine,enabling ultra-fast,high-quality color printing. 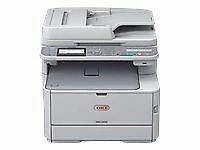 OKI MC573dn - multifunction printer (colour). Tech Data Product Data Sheet - OKI MC573dn(46552702). Product Data Sheet - Brochure - OKI MC573dn(46552702). Automatic duplex printing (2-sided). Print up to 22ppm (Colour). USB & Ethernet connections. Print up to 24ppm (Mono). Print, Scan, Copy & fax functions. We will always go out of our way to source the product you are looking for. Automatic duplex printing (2-sided). Print up to 22ppm (Colour). Print up to 24ppm (Mono). Print, Scan, & Copy functions. We will always go out of our way to source the product you are looking for. Add to Favourites. USB, Ethernet and Parallel Connections. Add to Favourites. We will always go out of our way to source the product you are looking for. Automatic duplex printing (2-sided). Print up to 27ppm (Colour). Print up to 31ppm (Mono). Print, Scan, Copy & Fax Functions. We will always go out of our way to source the product you are looking for. 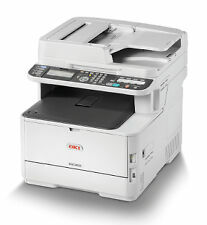 OKI MC573DN A4 Colour Laser Multifunction Printer. 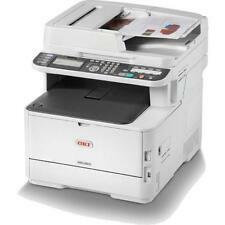 OKI MC573DN A4 Colour Laser Multifunction Printer 46552702. It's also speedy to get started, turning out the first page in an average of just seven and a half seconds. 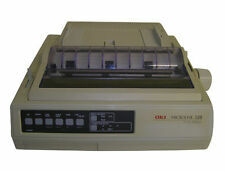 Oki Microline 320 Elite - Dot Matrix Printer. The Printer Broker Ltd is a supplier of printers, fusers and printer parts based in Bolton, Greater Manchester, UK. OKI MC-760DN. Drivers for these are available from the OKI website. A4 COLOUR LED PRINTER. If you need help with your installation our engineers will be happy to help you. before signing for as OK.